湖泊科学 2016, Vol. 28 Issue (1): 22-30. DOI: 10.18307/2016.0103. 谢丽娟, 余得昭, 曾诚, 沈宏, 细菌群落组成对微囊藻水华分解过程的响应. 湖泊科学, 2016, 28(1): 22-30. DOI: 10.18307/2016.0103. XIE Lijuan, YU Dezhao, ZENG Cheng, SHEN Hong. The response of bacterial community composition to the decomposition of Microcystis blooms. Journal of Lake Sciences, 2016, 28(1): 22-30. DOI: 10.18307/2016.0103. 摘要：为探究细菌群落组成对微囊藻水华腐败分解过程的响应, 在太湖梅梁湾沿岸进行为期11d的原位围隔实验, 模拟蓝藻水华聚集分解过程, 并监测了此过程中水体环境因子和细菌群落组成.结果表明, 水体理化因子和细菌群落组成在微囊藻水华分解的过程中发生了显著变化.冗余分析显示细菌的群落组成与水体氧化还原环境(溶解氧或氧化还原电位)、pH值、浮游植物生物量和营养盐浓度(总磷、硝态氮浓度)密切相关.研究还发现了某些与微囊藻水华分解密切相关的特殊细菌类群, 其中隶属于黄杆菌科(拟杆菌门)的一个类群在微囊藻厌氧分解的阶段占据显著优势, 其功能有待于进一步研究. 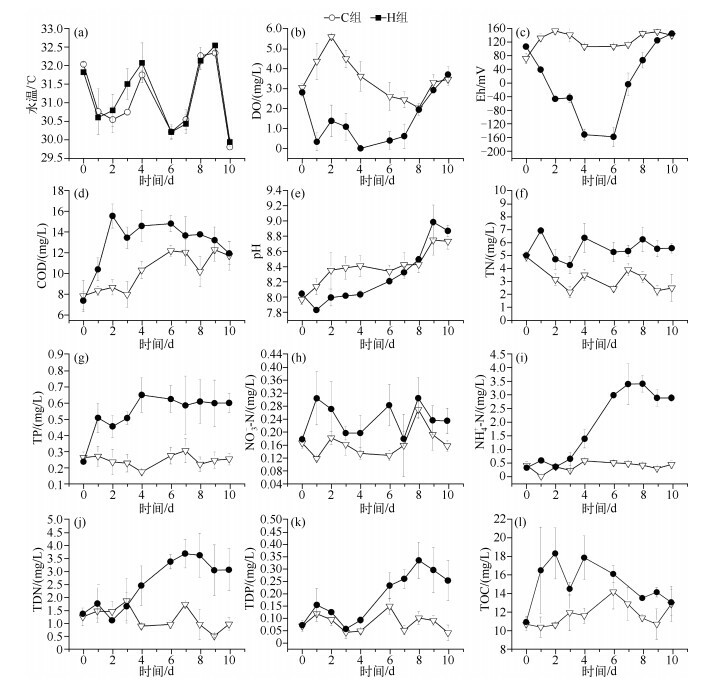 Abstract: To explore the response of bacterial community composition (BCC) to the decomposition of Microcystis blooms, we conducted an eleven-day in situ enclosure experiment to simulate the aggregation and decomposition of cyanobacterial bloom near the shoreline of Meiliang Bay, Lake Taihu. The water quality parameters and the BCC in enclosures were monitored. The results showed that the physicochemical factors and the BCC significantly changed during course of the decomposition of Microcystis blooms. Redundancy analyses induated that the redox state of environment (showed by dissolved oxygen or oxidation reduction potential), pH, biomass of phytoplankton and nutrient elements (total phosphorus and nitrate nitrogen) were closely related to the variation of the BCC. We also found that specific taxons in response to the decomposition of Microcystis blooms appeared in our experiment. 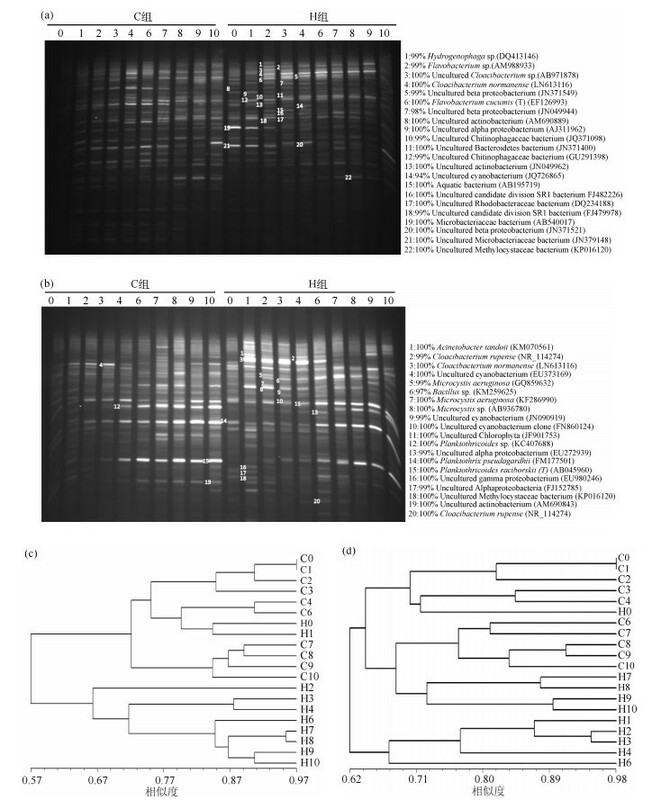 A taxon, which affiliated to Flavobacterium (Bacteroidetes), significantly dominated during the period of anerobic decomposition of Microcystis blooms. The functions of the bacteria group need further exploration. 方法参照细菌提取试剂盒(Omega，USA)的标准程序提取细菌的基因组DNA，之后使用带40 bp GC夹的细菌特异性引物357F(5’-CCTACGGGAGGCAGCAG-3’)和通用引物518R(5’-ATTACCGCGGCTGCTGG-3’)扩增模板DNA.采用50μl PCR体系，降落PCR方法，程序如下：94℃预变性5min；94℃变性1min，65℃退火1min，然后每个循环降低1℃进行10个循环；72℃延伸1min；55℃退火进行20个循环，72℃延伸10min.用1.2 %的琼脂糖凝胶电泳检测PCR产物量及扩增特异性. 基因组DNA扩增产物通过DGGE(Dcode system，BioRad)进行变性梯度凝胶电泳(8 % (w/v)聚丙烯酰胺凝胶(丙烯酰胺:双丙烯酰胺＝37.5 :1))，分析微生物群落多样性.聚丙烯酰胺的变性梯度范围为40 % ~60 %，缓冲液为1×TAE，电泳参数为：60℃，150V，7h.电泳结束后用核酸染料GelRed(用1×TAE进行1 :10000稀释)避光染色30min，然后用UV成像系统(Gene，Hongkong)成像、拍照. 实验期间主要环境参数的变化如图 1所示.添加蓝藻后，H组围隔中DO浓度迅速降低，而第5d(大雨)之后，DO浓度逐渐回升(图 1b)，与DO密切相关的Eh具有相似的变化规律，从第7d开始回升(图 1c).添加蓝藻后的1~4d，H组COD浓度迅速升高并显著高于对照组(P＜0.05)，第5d后COD值缓慢下降，实验后期与C组的COD值无显著差异(P＞0.05)(图 1d).在1~4d，H组的pH值低于C组(图 1e)，之后逐渐升高并高于C组.在添加蓝藻后的整个实验期间，H组围隔中TN和TP浓度显著高于C组围隔(P＜0.05)(图 1f和g)，NO3－-N的平均浓度也高于C组(图 1h).然而，NH4+-N、TDN和TDP浓度，在第0~3d，H组与C组中无显著差异(P＞0.05)(图 1i、j和k)，之后在H组围隔中迅速升高，采样后期显著高于C组(P＜0.05).H组围隔中TOC浓度在添加微囊藻后迅速升高，第1~4d明显高于C组(P＜0.05)，而第5d(大雨)之后，H组TOC浓度逐渐下降，直至实验结束时，且与C组值无显著差异(P＞0.05)(图 1l). 在第1d添加微囊藻后，H组围隔浮游植物生物量达到60.84mg/L，Chl.a浓度达到378.1μg/L，其中微囊藻生物量为58.58mg/L，占浮游植物总生物量的95.7 %，H组围隔中微囊藻生物量相当于严重水华水平(图 2).H组在添加微囊藻后，1~5d内浮游植物生物量不断下降，第6d直到实验结束，H组围隔的藻类生物量与C组无显著差异(图 2a)，微囊藻生物量的变化规律相似(图 2b)；而H组围隔Chl.a浓度则在添加藻后的第2d就迅速下降到与对照组相近的水平(图 2c)，这表明H组围隔中的微囊藻在1~4d发生快速厌氧死亡. DGGE图谱显示了两组围隔中浮游细菌与附着细菌群落组成的变化(图 3a、b).聚类分析结果(图 3c、d)显示，浮游细菌的群落组成可聚为两大类：其中C组所有样品与添加微囊藻前和刚添加微囊藻后的H0和H1聚为一大类，而剩下的H组样品聚为另一大类.其中H2单独聚为一类，H3和H4聚为一类，第5d之后的样品(H6~H10)聚为一类；而C组中0~6d的样品与H0和H1聚为一类，7~10d的样品聚为一类(图 3c).附着细菌的群落组成可聚为4类：H组添加微囊藻之前的样品H0与C组0~4d的样品(C0~C4)聚为一类，C组6~10 d的样品与H组7~10 d的样品聚为一类，H组中添加微囊藻后1~6 d的样品聚为一类(图 3d). 图 3a和图 3b所示编号为已进行回收测序的条带，与条带序列同源性最高的序列信息列于右侧.在浮游细菌群落中，H组出现多个隶属于黄杆菌科(Flavobacteriaceae)(拟杆菌门)的条带(条带2、3、4、6)，且明显占优势地位，而这些条带未在C组中出现.特别是条带4(隶属于黄杆菌科，与培养类群Cloacibacterium nor-manense的相似度为100 %)，在H组添加微囊藻后第2~10d的样品中均占显著优势.与条带4隶属于相同属的分类单元条带3出现在H1中，条带2出现在H组2~10d的样品中，隶属于黄杆菌属Flavobacterium(相似度99 %)，而隶属于同一属的条带6(与培养类群Flavobacterium cucumis (T)的相似度为100 %)在H组1~2d的样品中占据优势地位.而在H组2~3d的样品中占明显优势的分类单元条带5隶属于β-变形菌门(Betaproteobacteria).而放线菌门(Actinobacteria)是C组样品中的一个重要门类，在C组样品中占明显优势，如条带8、13、21.在附着细菌群落中，所测条带序列有一半隶属于蓝藻门，由于本研究的重点关注细菌，蓝藻序列在此不做讨论.在附着细菌中，我们发现，条带3与浮游细菌群落中条带4序列相同(与Cloacibacterium normanense的相似度为100 %)，且在H组第2~4d的样品中占绝对优势. 基于趋势对应分析第一长轴(DCA)＜2，利用RDA模型来寻找细菌群落组成与环境因子之间的相互关系.RDA的结果(图 4a)显示, 浮游细菌的群落组成与水体Eh、pH值、TP浓度、浮游植物生物量以及NO3--N浓度呈显著相关(P＜0.05)，两轴共可解释浮游细菌群落组成变化的44.55 %.其中，这5个环境因子依次解释了浮游细菌群落组成变化的20.0 %、15.2 %、11.1 %、7.1 %和6.2 %.附着细菌群落组成与pH值、TP浓度、DO浓度以及浮游植物生物量呈显著相关(P＜0.05)，两轴共解释附着细菌群落组成变化的35 %.pH值、TP浓度、DO浓度和浮游植物生物量分别解释了附着细菌群落组成的17.9 %、14.0 %、9.7 %和7.2 % (图 4b).图 4显示，浮游细菌样品聚为3类：第1类：C组样品与H0和H1；第2类：H组加藻后2~4d的样品；第3类，H组6~10的样品.附着细菌样品聚为4类：第1类：C组0~4d样品和H0；第2类：C组6~10d的样品；第3类：H组1~6d样品；第4类，H组7~10d样品.由此可见，RDA排序模型结果与DGGE的UPGMA聚类分析结果相似(图 3c、d). 目前，有多个细菌类群被认为与微囊藻水华分解有关.Li等通过蓝藻堆积的围隔模拟实验研究细菌的早期响应，发现微球菌亚目可能与微囊藻降解有关.Xing等在室内实验中发现梭菌属类群在微囊藻的厌氧分解中起着重要作用.而在本研究中最引起关注的是隶属于黄杆菌科(拟杆菌门)的一个类群(浮游细菌条带4和附着细菌条带3，与培养类群Cloacibacteriu normanense的相似度为100 %)，这个类群在微囊藻厌氧分解阶断占显著优势.通过同源性比对发现，与其相似性100 %的类群多出现在污水或厌氧污泥中，而Cloacibacterium normanense最早也是从污水中分离鉴定而来的，属于兼性厌氧菌.对这类细菌进一步的分离、培养及其生态生理特性的研究将有助于阐明其在微囊藻降解过程中的确切作用. Paerl H, Fulton RS, Moisander PH et al. Harmful freshwater algal blooms, with an emphasis on cyanobacteria. The Scientific World Journal, 2001(1): 76-113. Cole JJ, Findlay S, Pace ML. Bacterial production in fresh and saltwater ecosystems:a cross-system overview. Marine Ecology Progress, 1988, 43(1/2): 1-10. Paerl H, Pinckney J. A mini-review of microbial consortia:their roles in aquatic production and biogeochemical cycling. Microbial Ecology, 1996, 31: 225-247. 金相灿, 屠清瑛. 湖泊富营养化调查规范. 北京: 中国环境科学出版社, 1990. 胡鸿钧, 魏印心. 中国淡水藻类-系统, 分类及生态. 北京: 科学出版社, 2006. Muyzer G, De Waal EC, Uitterlinden AG. Profiling of complex microbial populations by denaturing gradient gel electrophoresis analysis of polymerase chain reaction-amplified genes coding for 16S rRNA. Applied and Environmental Microbiology, 1993, 59: 695-700. Braak Ct, Šmilauer P. CANOCO reference manual and CanoDraw for Windows user's guide:software for canonical community ordination (version 4.5). Section on Permutation Methods. Section on Permutation Methods. Microcomputer Power, Ithaca, New York, 2002. Höfle MG, Haas H, Dominik K. Seasonal dynamics of bacterioplankton community structure in a eutrophic lake as determined by 5S rRNA analysis. Applied and Environmental Microbiology, 1999, 65: 3164-3174.